Marie-Henri Beyle was born on 23 January 1783 in Grenoble, Isere, a district in France. He is better known by his pen name Stendhal. His father was a lawyer by profession and his mother passed away when he was 7 years old. He was an unhappy child aggravated by the lack of ‘imagination’ of his father. His aunt and a Jesuit Priest took care of him and Stendhal had disliked both of them. When he turned sixteen, he moved to Paris in hopes of achieving a career in writing and becoming a playwright. 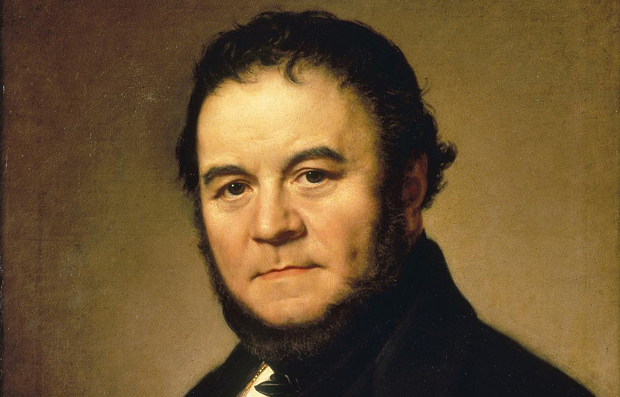 Due to some connections with the First Consul through a relative ‘Pierre Daru’, Stendhal got into the French army under ‘Napoleon’s’ command. He served as a lieutenant for over an year, fighting in Italy, Russia and Germany. Even after his retirement he remained in contact with the civil and military administration and worked for them till the fall of the French Empire. This was when his pay was reduced to almost half of the original. Stendhal finally decided to leave France. He moved to Italy where he entered many love affairs. His first book related to travels was published in 1817. This was his first writing which had the name ‘Stendhal’ as the author. He was in love with Matilde Dembowski, an affair that ended unhappily. He was exiled from Milan by the Metternich’s Police and thus in 1821 he moved once again to Paris. He earned his living by working in various salons of the city. His passionate affair with the countess Clementine Curial was on its peak. There were 215 love letters written by Stendhal to the countess declaring his love for her. In 1822 his book ‘De L’amour’ which means ‘On Love’ was published. It was based on his relationship with Matilde and the romantic passion between them. This kind of work was the basis of many of Stendhal’s books. He was a Romantic realist. The ‘Stendhal Syndrome’ named after him is basically the increase in pulse and heart rate and a dizziness from over exposure to beautiful art and immense beauty. This is how Stendhal described his feelings during his visit to Florence and in his book ‘Naples and Florence: A Journey from Milan to Reggio’. His book dedications were to ‘The Happy Few’ referring to the few people who truly understood his writing. Stendhal’s works included irony and psychological aspects. He loved music especially music of the famous composers Cimarosa and Mozart and Rossini. He also wrote a biography of ‘Rossini’ in his book ‘Vie de Rossini’ published in 1824. Some other books by Stendhal include ‘Armance’ (1827), ‘Le Rouge et le Noir’ translated as ‘The Red and the Black’ (1830), ‘Lucien Leuwen’ (1894), ‘La Chartreuse de Parme’ translated as ‘The Charterhouse of Parma’ (1893). Some of his novellas are ‘The Pink and the Green’ (1837) which was not finished, ‘Italian Chroniques’ (1837-1839) and ‘The Abbess of Castro’ (1832). Another biography by Stendhal besides that of Rossini is of Napoleon called ‘A life of Napoleon (1829). Stendhal died on 23rd March 1842, besotted by apoplexy in the streets of Paris.